I’m finally back to working on my monthly menus instead of just the weekly ones. I still find that this is the easiest and best way for me to save a lot of money and time. Two things I never seem to have enough of especially at this time of the year. A monthly menu only takes 5 minutes longer than a weekly one to create. As I was checking to see how many weeks were in November so I could print my menu planning worksheets, I decided to count up December too and print them all out. There are only 9 weeks left in this year. Yikes. Only 9 weeks and a list that would take much longer to finish. So what’s a girl to do? Plan, Plan, Plan and reward those who do (keep reading). Now I know to some of you this sounds crazy. How do you have time to plan out a monthly menu when you don’t even plan a weekly menu? It sounds too rigid! Too much information? Your life is too unpredictable! I’m sure you are coming up with your own excuses and reasons right now. Actually, what are they? I’d love to hear them and help show you how to overcome them. OK, so I’m going to ask you to stick with me here. Read to the end to find out how getting past this can win you a prize! If you are hosting company for Thanksgiving this month I’m guessing you’re not going to serve up hamburgers and fries. 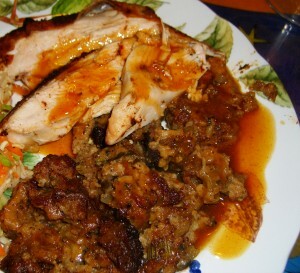 Last year I shared some tips on How to Cook Your Thanksgiving Meal Without Going Crazy. This comes with my entire meal and the work needed to serve that meal on a worksheet. With such a big meal coming this month and next month, take time to plan out what you’ll be eating the rest of the days. Make the meals leading up to the big day easy and even ones you could re-purpose or just reheat and eat. Also plan on what you’ll do with the leftovers from your big meal. Start by checking in your cabinets, pantry, freezer and refrigerator. Use The W.H.O.L.E. Gang Kitchen Inventory 2010 or your own list. ﻿Leading up to the big meal is a great time to cook up food you already have on hand so you’ll have room in the refrigerator, freezer and pantry when needed. Also, if you already have a couple of cans of organic pumpkin, don’t buy it now. Wait for it to go on sale and use what you have first. Now if you have 5 jars of poultry seasoning or pumpkin pie spice and you check the dates and they are all older than a year, toss them. Using the freshest possible herbs and spices will always make a difference. Now that you know what you have on hand start by adding the proteins to your menu. 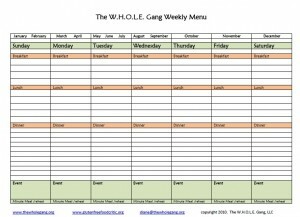 You can write your menu on your calendar or use The WHOLE Gang Weekly Menu 2010. Then add in the side dishes by incorporating what’s in season and what’s in the refrigerator, freezer and pantry. If you get into the habit of doing this every month you can just keep using your food inventory and adjust to the amounts on hand. I always use a pencil when working with both the inventory and menu planner. Don’t forget before you start adding food options to your menu planner that you look at the calendar and add events. School sports, banquets, plays, class events, business trips, holiday shopping trips, and company arriving. Anything that will take up your time in either preparing your meal or when yo get to eat it. If you do this you’ll save the money that would be spent grabbing something on the go and the aggravation of being all ready to bake that pumpkin pie and not have any cinnamon on hand. So how important do I think having a menu plan is. 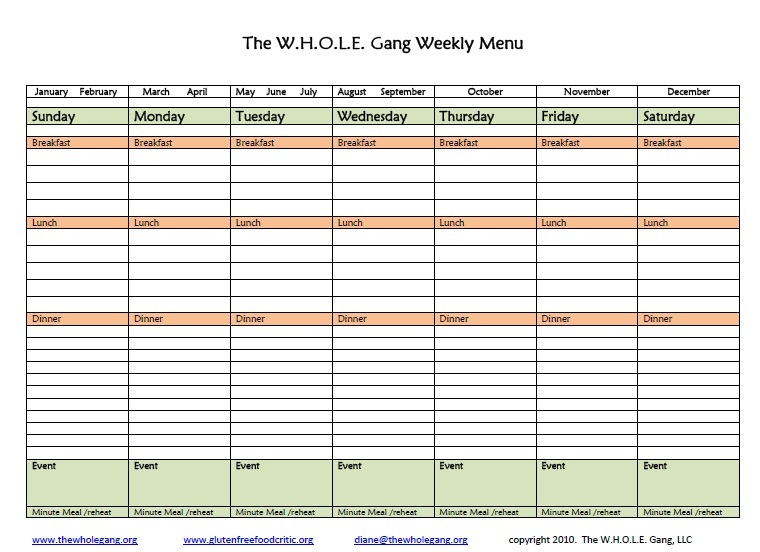 If you send me your Monthly Menu Plan for November by the end of the week you will be entered in a drawing. Prizes available will be a $25 gift card, The Gluten-Free Diner Cookbook and a 15 minute phone consultation with me. 1. Email me your menu plan for November and make sure your name is on the menu. I will print out the menus and draw 3 out of the pile. If you don’t do this first step, you are not entered to win. You cannot just copy and email me my menu and say it’s yours. I seriously doubt you have the same foods in your freezer as I do in mine. Tweet a link to this post and let people know they can win by sharing their monthly menu plan. You must come back here and leave me a comment letting me know that you tweeted. Leave a comment on your tip for menu planning. Entries due by Saturday November 6th, the drawing will take place on Sunday November 7th. I’d love to hear if this is your first monthly menu plan too. Ok, now here is my menu plan for the month. You may notice some things that are different than I usually make and a bit more British. I’m getting in some practice for our Boxing day event where lots of family will be here including relatives from London. I’m very excited and I’m looking to one of my favorite chefs, Jamie Oliver for a little guidance. This was shared on Orgjunkie. I emailed my menu and I don't Twitter, but I did put it on my blog. I think a good tip for menu planning is "planned" leftovers. If you plan to make extra chicken, beef, rice etc. then you will have that ready for another meal the next day or later in the week. Also, keeping a list of menu ideas handy for when you do your planning. Another good idea is subscribing to blogs (like this one) that have/post menu plans so you can get ideas. wow… that is amazing. I used to do a weekly planner, but since I found out that I am Gluten, wheat, sugar, cheese, and egg intolerant… I have no clue what to do anymore. WE are not huge fish people… I do white fish because it's less "fishy tasting". I am still learning and am at a loss. We are on a T.I.G.H.T budget… so I only shop what is on sale … which also makes meal planning hard for me. I do wish I could go back to the planning, it's just not doable at the moment. You are an amazing mother to be able to get all that together.. .you are doing a great job! Christy- actually you can plan and it will save you a lot of money. I save 40% off my grocery bill now. You can start by going back to a weekly menu but start your week according to the sales. Our flyers come on Wednesdays. That would be my planning day. Once you get going you may start to have a little extra to buy say one more roast while it's on sale and stick it in the freezer. Now using it is the key. So that means take a few minutes to inventory your food on hand. Using that to start your menu will really save you too. Making a shift when you have to cut out foods takes some time to get used to so don't beat yourself up. You're still learning how to adapt. Let me know if I can help. Catch up with me on facebook and I can help you plan.